We now have times for screening our film “ONE TABLE TWO ELEPHANTS” (84 minutes, work in progress) at the ACC International Urban Conference 2018 in Cape Town. Screening including Q&A with Henrik Ernstson. Saturday 3 Feb 2018, 13:00-15:00. NEVILLE ALEXANDER Lecture Theatre 1A, Upper Campus, UCT (the venue lies on the ground floor of the Neville Alexander building that lies between the New Lecture Theatre and Leslie Social Science building). These two screenings are especially organised for the ACC IUC 2018 delegates and UCT Film & Media students. No need to RSVP. Short trailer of the film embedded below. Please join us to see the film and discuss this film-based effort to research and engage African urbanism and Situated UPE. 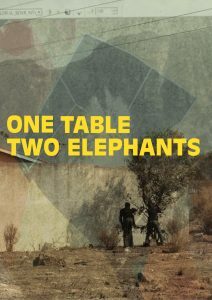 ONE TABLE TWO ELEPHANTS is a film about bushmen bboys, a flower kingdom and the ghost of a princess. Entering the city through it’s plants and wetlands, the many-layered, painful and liberating history of the city emerges as we see how biologists, hip hoppers, and wetland activists each searches for ways to craft symbols of unity and cohesion. But this is a fraught and difficult task. Perhaps not even desirable. Plants, aliens, memories and ghosts keep troubling efforts of weaving stories about this place called Cape Town. Situated and grounded in lived experiences across a range of groups, this film follows different ways of knowing and tries to be a vehicle toward difficult yet urgently needed conversations about how race, nature and the city are intertwined in our postcolonial world where history is ever present in subtle and direct ways. Based on years of research in Cape Town, this ‘cinematic ethnography’ is directed towards a wider audience, from the general public to students and scholars as it brings texture to understand a city like Cape Town, while providing ample possibilities to translate what is happening “there” to conversations about your own city and surroundings. This film is also an effort to develop a film-based research practice to engage and represent the texture of cities of the global South as departure point for discussing their political and socioecological structures and possibilities. Read more on the film’s official website and about our other on-going film-based projects in Durban and upcoming in Kampala. Created by: Jacob von Heland and Henrik Ernstson. Photography (DOP): Johan von Reybekiel. Sound: Jonathan Chiles. Production coordination: Jessica Rattle and Nceba Mangesi.